Situated in central Switzerland, Engelberg was founded in 1120 by Benedictine monks who built the monastery which dominates the village even today. The monks also gave Engelberg its name, which means "Angel Mountain", and refers to the impressive Titlis mountain which towers above the resort. Two of the Monks from the Monastery were the first to climb to the summit of Titlis in 1744. From the 19th century, Engelberg became internationally known as a resort and spa, but is today visited as much for skiing as for its clean air. With its combination of modern sports facilities and alpine location, Engelberg is a magnet for both summer and winter tourism. Engleberg's impressive snow-sure Titlis glacier zone is served by the Rotair, a 360-degree revolving cable car, rising up to a 3,020m, giving awesome panoramic views along the way. As the resort is situated at just 1,050m this means that in good conditions there is an impressive vertical drop of almost 2,000 metres on a run that is 12km long. There are challenging black and red runs from the Titlis top station down to Stand (2,428m) and on to Trubsee (1,800m). From Trubsee you can then take the Trubsee-Hopper chairlift across the frozen lake to Alpstibli, from where there is access to the lifts on Jochstock (2,564m)/ Joch Pass area as well as a variety of runs right down to the valley floor. For those with guides, there are great off-piste opportunities on the Titlis sector, most notably the famous Laub route that has a vertical drop of 1,000m. Engelberg’s other main ski area is the Brunni sector on the other side of the valley, which rises up to 2,040m and is especially well suited to intermediates. 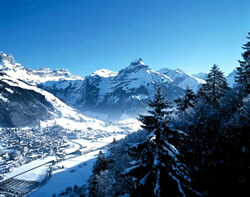 In total Engelberg has 82km of pistes and 27 lifts — more than enough to keep decent skiers entertained. Engleberg has lots to entertain visitors in the summer to suit everyone from most active to those seeking rest and relaxation. There are numerous walking and hiking trails available, via ferrata, a super golf course and why not try something a bit different - a whey bath! Whey has been known for its healing properties for a long time. A whey bath is refreshing and calming to sensitive or normal skin, making it smooth and silky. Lie back and enjoy a healing and relaxing whey bath in front of the Gerschni alpine hut at the foot of the Titlis. Take a refreshing shower after the bath and you will feel newly born. Pure nature! tobogganing, nordic skiing, walking and snow shoe trails, ski-touring, swimming pool, spa facilties, ice rinks, curling, paragliding, dog sledding, sleigh rides. superb scenery, hiking trails, tennis, climbing, golf, horse riding, summer music festivals, via ferrata, mountain biking. A good choice of restaurants, ranging from gourmet to the more informal, with lots of choice of types of cuisine and to suit a range of budgets. Good choice of bars, again with enough choice to suit everyone. winter walking trails available. The town is quite lively and bustling, and Lucerne is just an hour by train.